In this article, I will explain some useful UNIX or GNU/Linux tools, such as file & folder operations, finding files, archiving files, and short introduction to editors. Unix is a multitasking, multi-user computer operating system that exists in many variants. The original Unix was developed at AT&T's Bell Labs research center by Ken Thompson, Dennis Ritchie, and others. GNU is a Unix-like computer operating system developed by the GNU Project. It is composed wholly of free software. 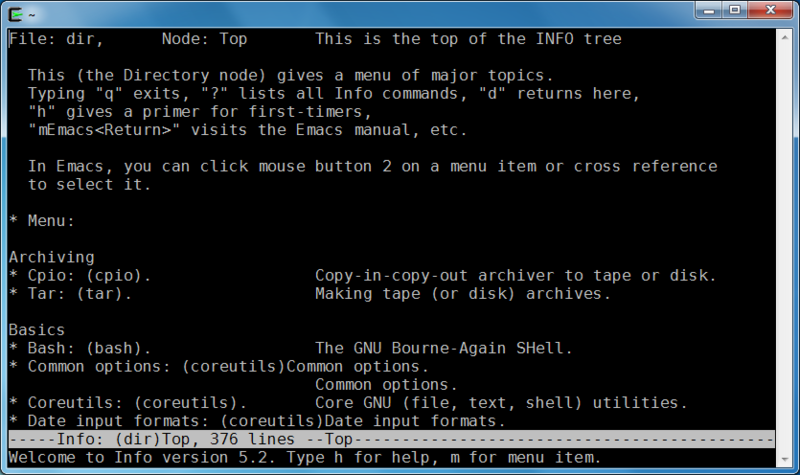 It is based on the GNU Hurd kernel and is intended to be a "complete Unix-compatible software system". GNU is a recursive acronym for "GNU's Not Unix! ",chosen because GNU's design is Unix-like, but differs from Unix by being free software and containing no Unix code. The Free Software Foundation uses the name GNU/Linux, which has led to some controversy. You can download Cygwin setup here: https://cygwin.com/install.html. With setup.exe, you can choose most of the Linux tools you may be interesting in. 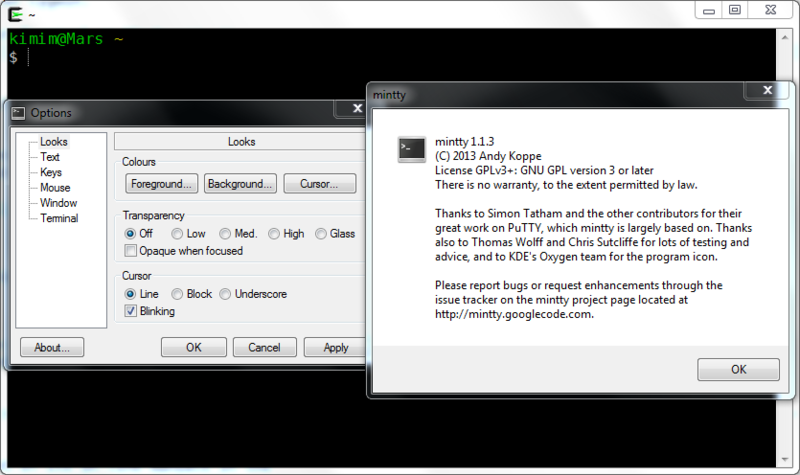 Mintty is a terminal emulator for Cygwin. UnxUtils ports common GNU utilities to native Win32. and not an emulation layer like that provided by Cygwin tools. There are two kind of online help you may frequently use when playing with *nix. 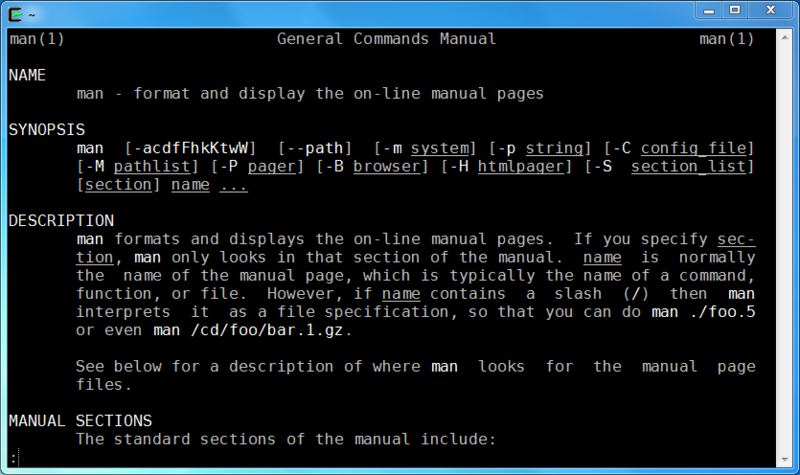 man formats and displays the on-line manual pages. man is normally the name of the manual page, which is typically the name of a command, function, or file. The GNU Project distributes most of its on-line manuals in the "Info format", which you read using an "Info reader". `cat' copies each FILE to standard output. `nl' writes each FILE to standard output, with line numbers added to some or all of the lines. `cksum' computes a cyclic redundancy check (CRC) checksum for each given FILE. `md5sum' computes a 128-bit checksum (or "fingerprint" or "message-digest") for each specified FILE. The tar program is used to create, modify, and access files archived in the tar format. "tar" stands for Tape ARchive. It is an archiving file format. tar was originally developed in the early days of Unix for the purpose of backing up files to tape-based storage devices. Gzip reduces the size of the named files using Lempel-Ziv coding (LZ77). .tgz and .tar.gz are very common in *nix world. `find' searches the directory tree rooted at each file name FILE by evaluating the EXPRESSION on each file it finds in the tree. `grep' searches input files for lines containing a match to a given pattern list. grep any line contains "quicc"
* results when turning off the mmu. GNU utils provide xargs and -exec for passing result from last command to next command. Vim stands for Vi IMproved. Vim is a text editor which includes almost all the commands from the Unix program "Vi" and a lot of new ones. Availability. Preinstalled in almost all the *nix operating system.